Nothing says Spring quite like the sight of a primrose. But why wait for Spring? Bring a taste of spring into your home, whatever the season – a pot of crocheted primroses will brighten your day in a glorious riot of colour! Primroses is an original crochet pattern by June Gilbank. 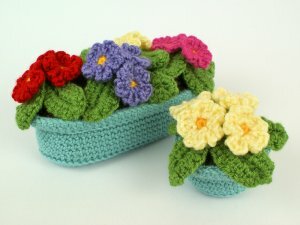 This pattern includes full instructions to make your own realistic crocheted primrose plants, complete with crinkled leaves and heart-shaped petals. It also includes patterns for two primrose arrangements: a large planter filled to bursting with multi-coloured blooms for maximum impact; and a small round pot containing a single plant perfect to brighten small spaces. Date Added: 07/21/2017 by Gemma H.
A pretty and fun pattern! This pattern is well-written, very detailed, and clear throughout. Date Added: 04/24/2016 by Annette H.
Date Added: 04/26/2015 by Aleksandra S.
Date Added: 10/30/2014 by Becky G.
Date Added: 04/28/2014 by Judy C.